Ever since the news hit that Newsweek‘s new owner is combining the publication with Tina Brown’s web-based media outlet The Daily Beast, there has been a frenzy of criticism over the decision to kill Newsweek‘s website and redirect readers to The Daily Beast site instead. Felix Salmon of Reuters, for example, called it “bizarre,” and Newsweek.com staffers quickly set up a Tumblr blog to complain about the move, which they said was a result of senior managers who “deep down, don’t understand the web.” But is killing Newsweek.com such a bad idea? Not necessarily. In many ways, Newsweek is facing the same kinds of wrenching decisions that other traditional media entities are — such as the New York Times, which is reorganizing its newsroom even as it prepares to launch a paywall in an attempt to produce digital revenues and/or shore up its print circulation (lacklustre numbers from News Corp.’s recently launched paywall notwithstanding). The key question is: How much emphasis will be placed on the web as opposed to print? The Washington Post, which also recently merged its newsrooms, has been criticized by some because “the print side won.” Will the print side dominate at the NYT as well? At least Newsweek‘s decision shows the web has a fighting chance of driving the agenda at the merged entity. The main reason most critics have given for keeping the Newsweek site (apart from the fact that lots of talented people have worked hard to build it, as the Tumblr blog argues) is that it gets a lot more visitors than The Daily Beast does. According to Quantcast, Newsweek’s site gets about 7 million unique visitors a month compared with about 4 million for The Daily Beast. However, as noted in a piece at Ad Age, the visitors to Tina Brown’s site return more frequently and stay longer when they are there. Those are important metrics when it comes to reaching (and keeping) advertisers, and that’s expertise that the new Newsweek desperately needs. On a more personal note, while I’ve only visited The Daily Beast a couple of dozen times since it launched, that is still about 25 more visits than I have ever made to Newsweek.com — nor am I ever likely to go there. I realize that I’m not the typical online media consumer (and I’m sure the work being done by the Newsweek web staff is excellent), but there is an argument to be made that when it comes to an online audience, the Newsweek brand name may actually have a negative connotation rather than a positive one. The site won’t be disappearing entirely: Tina Brown says it will live on under its own banner, and links will obviously be redirected so that past content doesn’t disappear. The reality is that Newsweek is a failing brand, with a failing business model — otherwise it wouldn’t have had to put itself on the block and be sold for the equivalent of $1 U.S. (plus the assumption of $40-million in debt). So why keep a website shackled to that fading name? Nostalgia? It’s true that the Daily Beast website is smaller, and that the startup is also said to be losing money. But at least its audience has been growing rather than shrinking, and regardless of Tina Brown’s print-based past, the Beast has a reputation as a smart web operator, not unlike the Huffington Post. Better to ride that pony than try to breathe life into another faded old-media brand. The New York Times is a lot better off than Newsweek, obviously, but it has to make a similar choice: embrace the web, and all that entails, or allow the declining print side of the business to remain at the forefront and control the decision-making process? The fact that the newspaper is still considering a paywall (albeit one with openings to allow for social media, apparently) seems more like a defensive move than anything else. At least Newsweek‘s new owner is thinking differently. You are not giving the NYT enough credit, and you cite no examples for how the Times doesn’t “embrace the web.” I saw first hand how over the last decade how the management of the paper evolved the newsroom to increasingly emphasize the Web. It certainly operates like an online news organization with a big paper summary of the last 24 hours delivered to 1 million people each day who want that sort of version. You also don’t understand the nature of the paywall choice. Many of those 1 million people are happy to pay a large sum for the Times and will still be willing to do so as their reading preferences move to electronic devices. There is a very fair debate about whether the paywall is a good idea. I’m not sure what I’d do if I ran the company. But I know that I’d think long and hard before I turned down large sums of money from a lot of people who value what my company does so highly. Thanks for the comment, Saul — and you are quite right that the NYT has made large strides over the past few years when it comes to embracing the web. I would not want to take any of that away from them, or any of their talented web staff, many of whom I admire. As for the paywall, however, I think I do understand the nature of the choice — I worked at a newspaper that did the exact same thing, and came to regret it just as the Times did. Perhaps I am wrong, but I don’t see any reason to think that has changed. “Daily Beast” sounds like some sort of sophomoric arrested-development student newspaper from the 1970s with reviews of tone deaf rock bands and creepy folk singers who wear sandals and socks and never wash. Deeply unattractive name. Newsweek is short, simple and descriptive. Not that I read either. Confession: My wife and I started getting Newsweek a few years ago because we got some ultra-cheap offer and we read it fairly regularly, though we often skipped the political news. And I think it’s fair to say we only went to the Web site to email a story to a friend. All that said, I think one of the dumbest moves Newsweek made was their recent redesign of the print product. They took out all of the lighter content, removed a lot of the wit and humor and shoved more political analysis in there that is frankly, boring as hell. It’s as if they thought they could become another Economist or something. I don’t know who they had in their focus groups or if they even asked for input (probably not), but they took out most of the stuff that appealed to people who either a) don’t want to read yet another piece on TARP, Palin or Obama’s battles with the GOP and/or b) simply don’t have the time (which is one reason we started taking The Week a couple of years ago). On top of that, they did one more thing that was colossally idiotic: they changed the typeface and/or made it smaller, making it harder to read, especially for the gray hairs who probably make up 75% of their core readership. If anything, they should’ve made the type larger! Even I had trouble and I’m in my early 40s. Interestingly, I raised this point with execs at the newspaper where I work. If we’re not going to try to reach new, younger readers with our print product, then we may as well start working on a large-print version of our paper. The pending paywall makes sense for the NYT, but they need to be careful that they don’t make the same mistake they have been making with their single copy sales, pretending access cost don’t matter. The pricing model that I have seen for the online NYT is nearly the same as it would be to get it delivered to my home. Thing is, it costs the Times far less to get it to me over the Internet than it does to print and deliver a physical copy. I desperately want NYT to survive. If they charge too much for online access, they will lose most of their user base and threaten their existence. It isn’t about what media insiders and the New York cocktail party set think (“Ooh, I read The Beast, but never visit Newsweek”); it’s what the general public thinks. 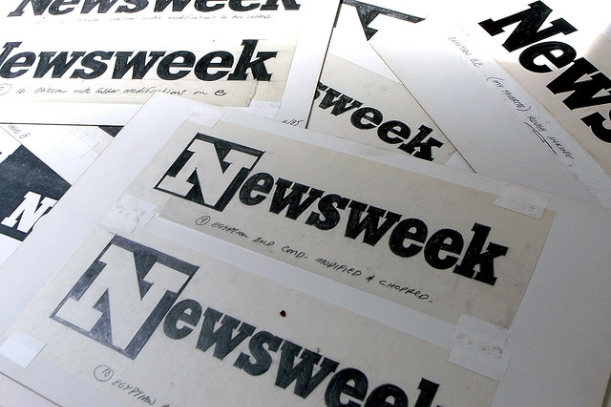 While tarnished, the Newsweek brand has far more general recognition than The Beast will ever have. Grab 100 people in a shopping mail somewhere in Illinois or Georgia or wherever– most will have heard of Newsweek, while very few will have heard of The Daily Beast. Go outside the US, and The Beast’s recognition likely plummits to zero. And Newsweek’s recognition is worth a lot of money if properly reformed. Use it as a jumping off point for rejuvenation, not elimination. There are plenty of brands that has been down this road. The Beast is a niche brand and always will be no matter how much marketing is thrown at it. I would hazard to say that Newsweek is more recognizable than the HuffPost, even though HuffPost gets much more traffic. Any marketer worth his or her salt can parlay that into something much more. Also, The Beast is bleeding money ($10 million for 70 odd employees), proportionately much more than Newsweek (which has 10x the revenue and 3x employees but only slightly more losses). And The Beast has less than half the traffic, which has been fairly flat recently. So if Barry Diller can’t build a megasite by pouring untold millions into a large hole branded The Beast, what’s going to be different going forward? 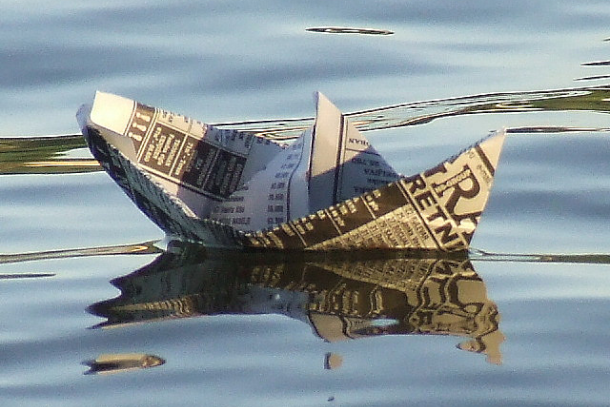 Big and reputed publications are going down because they couldn’t keep up with the changing consumption habits of their audiences. The market for news is still there, they just need to figure out how to monetize that content profitably. One solution could be collaborating with companies that develop integrated devices such as Kindle and iPad, something of the sort that Microsoft did with PC manufacturers. Most of Microsoft’s initial money came from shipping the operating system with every possible PC in the world. Another problem is of course micro-payments. When publications are able to charge miniscule payments automatically so that readers can access the content without obstruction, it will be easier to charge for news content. Glad to hear I’m not the only one who visits The Daily Beast a couple dozen times a month — but hasn’t been to Newsweek.com once since, oh, 1995 or so. In my opinion, the Newsweek archives should be reorganized into topical landing pages at minimum, providing new visitors with access not only to the rich and storied history of Newsweek, but also to provide links to current Daily Beast articles, workflows and reporters. That’s a great idea, Brian — thanks for the comment.